Without the internet instantly dispersing images to millions of people, it was probably a lot easier to keep video game prototypes under wraps in the ‘80s. 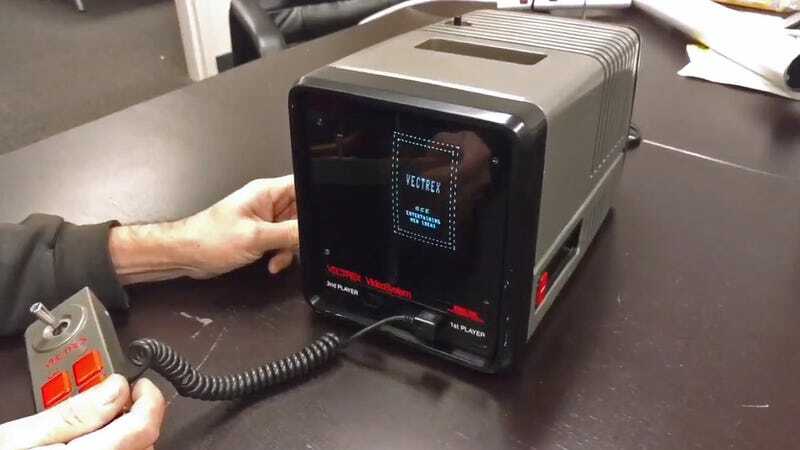 Just a handful of photos backed up rumors about the possible existence of a miniature version of the ill-fated Vectrex console, but it’s a rumor no more now that the National Videogame Museum in Frisco, Texas has managed to get its hands on that mythical prototype for its collection. The Vectrex was part of the post-Atari video game boom that had almost every toy maker trying to get a console on the market, including Milton Bradley, which was better known for board games at the time. The Vectrex could render vector graphics on its own portrait-oriented screen (which used the same technology as oscilloscopes do) to bring arcade-quality gaming into the home. But it came with a steep price tag, close to $500 in today’s funds, and arrived just in time to be one of the many victims of the 1983 video game crash. Even with its built-in 9-by-11-inch screen, the Vectrex was by no means a cumbersome piece of hardware. Its controller even slotted into the front of the console so that the whole thing was easier to move around. But an article in the April 2003 issue of Edge magazine revealed the possible existence of a much smaller, shoebox-sized Vectrex console that a fan spotted on the president’s desk during a tour of the company in the early ‘80s. Then, roughly eight years ago, someone claiming to be the son of someone who worked in the research and design division at Milton Bradley shared scanned vintage photos of the alleged mini Vectrex on Flickr. 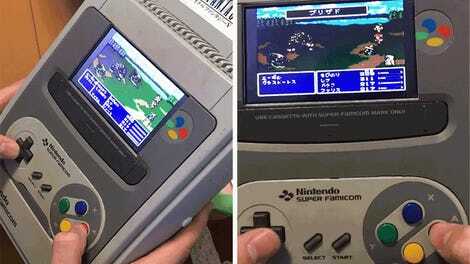 They looked real enough, but were far from definitive proof that the console actually existed, or even made it past the initial mock-up design phases. A few weeks ago, however, the existence of the mini Vectrex console was confirmed by the National Videogame Museum, which announced on Twitter that it had managed to secure the actual prototype for its collection. To confirm its authenticity, the museum even took the prototype apart and found much of the same circuitry as the Vectrex hardware that actually hit the market. The museum even shared a video of the travel-size mini Vectrex powering up, which, surprisingly, still works just fine. With a carrying handle integrated into the top of the console, the mini version of the Vectrex was undoubtedly designed to be far more portable than the original hardware. But did it directly influence the creation of the Nintendo Switch, or even the Game Boy which arrived a few years after the Vectrex died? The prototype was a well-protected secret, but you might argue that hardware designers in the industry move from company to company, and secrets undoubtedly get shared. While the mini Vectrex would have still required you to bring along a power cord wherever you went, as a kid I would have loved to bring this thing along on road trips, visits to grandmas, or basically anywhere my Switch now gets taken—pending available outlets, of course. Update, November 30, 12:18 p.m. EST/EDT: John Hardie, the director of the National Videogame Museum, has sent us a few size-comparison photos showing the mini Vectrex sitting next to the original console. The recently acquired hardware is a little deeper than the original Vectrex, but its overall dimensions are considerably smaller, and it would have indeed been a lot easier to travel with. Although maybe not as easy to play on a long flight as the Nintendo Switch is.